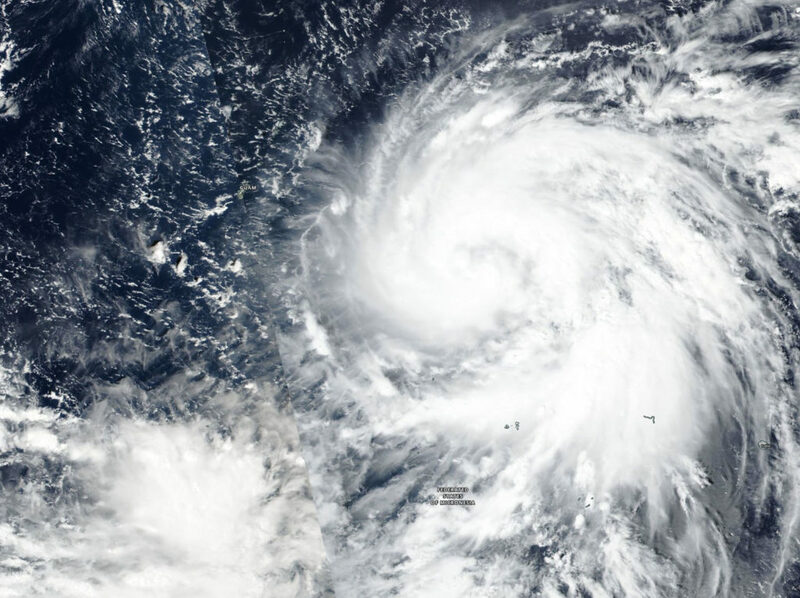 Tropical Storm Yutu continued strengthening as NASA-NOAA’s Suomi NPP satellite passed overhead. On Oct. 23, Yutu was a strengthening typhoon east of Guam. On. Oct. 22, the Visible Infrared Imaging Radiometer Suite (VIIRS) instrument aboard NASA-NOAA’s Suomi NPP satellite passed over the western Pacific Ocean and captured a visible image of Yutu. VIIRS revealed a well-organized storm, and showed powerful thunderstorms around the center of circulation and in thick bands spiraling into the center from the northern and southern quadrants. At the time Suomi NPP passed overhead, Yutu was east of Guam and its southern quadrant was affecting the Federated States of Micronesia. The VIIRS image showed that the storm is about 400 miles in diameter. On Oct. 23, NOAA’s National Weather Service (NWS) in Tiyan, Guam noted several warnings and watches. Typhoon warnings remain in effect for Rota, Tinian and Saipan. A Tropical Storm Warning is now in effect for Guam. A tropical storm watch remain in effect for Alamagan, Pagan, and Agrihan. At 10 p.m. CHST local time (8 a.m. EDT /1200 UTC) on Oct. 23 the center of Typhoon Yutu was located near latitude 12.0 degrees north and longitude 149.6 degrees east. That’s about 330 miles east-southeast of Rota and about 335 miles southeast of Saipan. Yutu is moving west at 10 mph. It is expected to maintain this general course and speed over the next 24 hours. Maximum sustained winds have increased to 90 mph. Yutu is forecast to intensify through Wednesday, Oct. 24.Typhoon force winds extend outward from the center up to 60 miles. Tropical storm force winds extend outward from the center up to 200 miles to the northeast and up to 155 miles elsewhere. Typhoon conditions are expected Wednesday night through Thursday morning (local time) at Tinian and Saipan. Typhoon conditions are expected for Rota Wednesday afternoon through Thursday. Tropical storm conditions are expected for Guam late Wednesday afternoon through Thursday. Tropical storm conditions are possible within the next 24 to 36 hours at Alamagan, Pagan, and Agrihan.